Hi, First of all this is late and will be shorter than I had wanted to write due to major upheavals and uncertainties here ant Keen PM where I work. Not everything is sorted out, but for now I have a job until at least October, or so I've been told. This last weekend was the first El Mirage race of the season. On Saturday Mark and his son Matt drove up to our house and then we all drove up together and arrived on the lake just before noon. 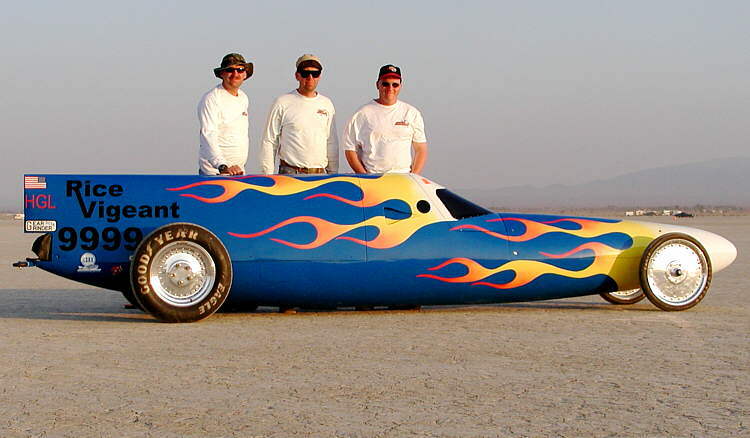 When we first raced 14 years ago our car was one of the ugliest out there, but we were racing. This time we are arguably one of the best looking. From the time we rolled it out of the trailer people were taking photos. Sunday, we were 35th in line to race due to our points last year. Mark's new job will be taking up his weekends so we let him drive this time. In November, we had gone 169 MPH with some temporary extra air scoops to help feed the motor. This month we ran with out them and also without the permanent air scoop which isn't finished yet. Through the lights Mark went 166.007MPH, almost exactly what I thought we would do with out an air scoop. Unfortunately, the meet was called just before our second run due an accident with one of the racers. The driver was badly injured and flown to the hospital where he slowly recovering. Our car is a very different type and I think many, many, times safer than the one that crashed.